This recipe makes The BEST Homemade Waffles. Seriously! They are crispy on the outside and light and fluffy on the inside, just the way a waffle should be! When the weekends roll around, we like to have a big, hot breakfast! The kids are always asking for pancakes or waffles, and after lots of testing, I have come up with the BEST Homemade Waffle recipe! I tried over and over to come up with a waffle recipe that was truly delicious, with just the right texture. A lot of batches came out tasting great, but they were too dense, or too soft, or too…blah. I discovered a few tricks that help make these the winning batch! *Cinnamon! Not a lot is needed here, and they don’t taste super cinnamony, but it’s enough to make your taste buds say “ohhhhhhh”! *Beat the egg whites into big fluffy clouds before adding to the batter. THIS is the biggest tip to make a fluffy yet crisp waffle. It’s worth the extra step, I promise! *Cornstarch! Replacing some of the flour with cornstarch makes these soft and fluffy on the inside. I hope you enjoy these as much as we do! I have made them several times now, and they are everyone’s favorite! You can even freeze them (then pop in the toaster oven to reheat) for a quick weekday breakfast! « Chocolate Crinkle Gooey Butter Cookies from Scratch! These were delicious, even when I doubled the recipe but accidently still added 2 eggs. I also didn’t have buttermilk, so I used a cup of milk mixed with a Tbls. white vinegar. Still turned out amazing! I was a little confused about the nutmeg though, it never says what to do with it! I just left it out. I don’t see where you added the nutmeg so I just added it to the dry ingredients. FYI Egg whites will stiffen best if whipped when at room temp. Let your eggs warm up a little after removing from the frig. the best way to get them stiff is to make sure the bowl is dry that there’s absolutely no egg yolk like even Affleck of yolk will keep them flat. You can always add a quarter teaspoon of cream of tartar. What’s even easier than that is a teaspoon of lemon juice per every two eggs. Then add the sugar very slowly. Can these be made ahead of time? If so, how do you preserve them? Wahoo! 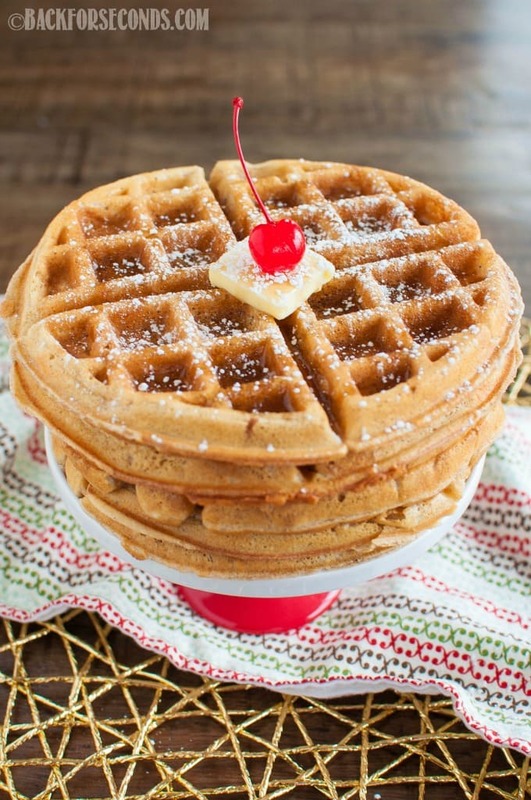 Crispy waffles. First time I’ve gotten my waffles to do that. I will try the extra half cup of flour because the batter did seem runny. Delicious!